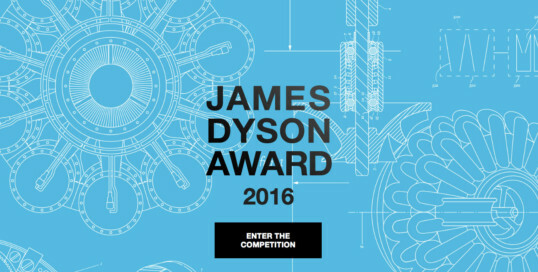 The James Dyson Foundation has recently opened its 2016 international student design competition, for products or concepts which solve tangible problems. Students and recent graduates of design or engineering are invited to enter inventions that do more with less, designed with the environment in mind. Submitted projects should have a significant and practical purpose, and have the potential to be commercially viable. One International Winner will be awarded $45,000 + $7,500 for their university. An International Runner-up and twenty-two (22) National winners will also be announced. The International Runner-up will be awarded $7,500 and each National Winner, $3,500. The James Dyson Award is open in 22 countries around the world — Australia, Austria, Belgium, Canada, China, France, Germany, Hong Kong, Ireland, Italy, Japan, Korea, Malaysia, the Netherlands, New Zealand, Russia, Singapore, Spain, Switzerland, Taiwan, UK or US — for both individual and team entries. Eligible for entry are product design, industrial design, and engineering university students – or graduates within the past 4 years.